Aerosol spray is a type of dispensing system which creates an aerosol mist of liquid particles. It is used with a can or bottle that contains a payload and propellant under pressure. When the container's valve is opened, the payload is forced out of a small hole and emerges as an aerosol or mist. As propellant expands to drive out the payload, only some propellant evaporates inside the can to maintain a constant pressure. Outside the can, the droplets of propellant evaporate rapidly, leaving the payload suspended as very fine particles or droplets. The concepts of aerosol probably go as far back as 1790. The first aerosol spray can patent was granted in Oslo in 1927 to Erik Rotheim, a Norwegian chemical engineer, and a United States patent was granted for the invention in 1931. The patent rights were sold to a United States company for 100,000 Norwegian kroner. The Norwegian Postal Service, Posten Norge, celebrated the invention by issuing a stamp in 1998. In 1939, American Julian S. Kahn received a patent for a disposable spray can, but the product remained largely undeveloped. Kahn's idea was to mix cream and a propellant from two sources to make whipped cream at home—not a true aerosol in that sense. Moreover, in 1949, he disclaimed his first four claims, which were the foundation of his following patent claims. 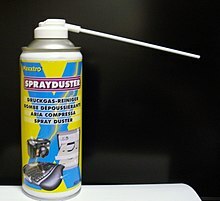 It was not until 1941 that the aerosol spray can was first put to good use by Americans Lyle Goodhue and William Sullivan of the United States Bureau of Entomology and Plant Quarantine, who are credited as the inventors of the modern spray can. Their design of a refillable spray can dubbed the aerosol bomb or bug bomb, is the ancestor of many popular commercial spray products. It was a hand-sized steel can charged with a liquefied gas under 75 pounds of pressure and a product to be expelled as a mist or a foam. A public-service patent was issued on the invention and assigned to the Secretary of Agriculture for the free use of the people of the United States. Pressurized by liquefied gas, which gave it propellant qualities, the small, portable can enabled soldiers to defend against malaria-carrying mosquitoes by spraying inside tents and airplanes in the Pacific during World War II. Goodhue and Sullivan received the first Erik Rotheim Gold Medal from the Federation of European Aerosol Associations on August 28, 1970, in Oslo, Norway in recognition of their early patents and subsequent pioneering work with aerosols. In 1948, three companies were granted licenses by the United States government to manufacture aerosols. Two of the three companies, Chase Products Company and Claire Manufacturing, still manufacture aerosols to this day. The "crimp-on valve", used to control the spray in low-pressure aerosols was developed in 1949 by Bronx machine shop proprietor Robert H. Abplanalp. If aerosol cans were simply filled with compressed gas, it would either need to be at a dangerously high pressure and require special pressure vessel design (like in gas cylinders), or the amount of payload in the can would be small, and rapidly deplete. Usually the gas is the vapor of a liquid with boiling point slightly lower than room temperature. This means that inside the pressurized can, the vapor can exist in equilibrium with its bulk liquid at a pressure that is higher than atmospheric pressure (and able to expel the payload), but not dangerously high. As gas escapes, it is immediately replaced by evaporating liquid. Since the propellant exists in liquid form in the can, it should be miscible with the payload or dissolved in the payload. In gas dusters and freeze sprays, the propellant itself acts as the payload. The propellant in a gas duster can is not "compressed air" as sometimes assumed, but usually a haloalkane. Chlorofluorocarbons (CFCs) were once often used as propellants, but since the Montreal Protocol came into force in 1989, they have been replaced in nearly every country due to the negative effects CFCs have on Earth's ozone layer. The most common replacements of CFCs are mixtures of volatile hydrocarbons, typically propane, n-butane and isobutane. Dimethyl ether (DME) and methyl ethyl ether are also used. All these have the disadvantage of being flammable. Nitrous oxide and carbon dioxide are also used as propellants to deliver foodstuffs (for example, whipped cream and cooking spray). Medicinal aerosols such as asthma inhalers use hydrofluoroalkanes (HFA): either HFA 134a (1,1,1,2,-tetrafluoroethane) or HFA 227 (1,1,1,2,3,3,3-heptafluoropropane) or combinations of the two. More recently, liquid Hydrofluoroolefin (HFO) propellants have become more widely adopted in aerosol systems due to their relatively low vapor pressure, low global warming potential (GWP), and non flammability. Manual pump sprays can be used as an alternative to a stored propellant. Liquid aerosol propellant filling machines require additional precautions, such as being mounted externally to the production warehouse in a gas house. Liquid aerosol propellant machines are typically constructed to comply with ATEX Zone II/2G regulations (classification Zone 1). A typical paint valve system will have a "female" valve, the stem being part of the top actuator. The valve can be preassembled with the valve cup and installed on the can as one piece, prior to pressure-filling. The actuator is added later. Modern aerosol spray products have three major parts: the can, the valve and the actuator or button. The can is most commonly lacquered tinplate (steel with a layer of tin) and may be made of two or three pieces of metal crimped together. Aluminium cans are also common and are generally used for more expensive products or products intended to have a more premium appearance, such as personal care products. The valve is crimped to the inside rim of the can, and the design of this component is important in determining the spray rate. The actuator is depressed by the user to open the valve; a spring closes the valve again when it is released. The shape and size of the nozzle in the actuator controls the aerosolized particle size and the spread of the aerosol spray. True aerosol sprays release their propellant during use. Some non-propellant alternatives include various spray bottles, squeeze bottles, and Bag on Valve (BoV) / Bag in Can (BiC) compressed gas aerosol systems. Packaging that uses a piston barrier system by CCL Industries or EarthSafe by Crown Holdings is often selected for highly viscous products such as post-foaming hair gels, thick creams and lotions, food spreads and industrial products and sealants. The main benefit of this system is that it eliminates gas permeation and assures separation of the product from the propellant, maintaining the purity and integrity of the formulation throughout its consumer lifespan. The piston barrier system also provides a consistent flow rate with minimal product retention. Another type of dispensing system is the bag-in-can (or BOV, bag-on-valve technology) system where the product is separated from the pressurizing agent with a hermetically sealed, multi-layered laminated pouch, which maintains complete formulation integrity so only pure product is dispensed. Among its many benefits, the bag-in-can system extends a product's shelf life, is suitable for all-attitude, (360-degree) dispensing, quiet and non-chilling discharge. This bag-in-can system is used in the packaging of pharmaceutical, industrial, household, pet care and other products that require complete separation between the product and the propellant. A new development is the 2K (two component) aerosol. A 2K aerosol device has main component stored in main chamber and a second component stored in an accessory container. When applicator activates the 2K aerosol by breaking the accessory container, the two components mix. The 2K aerosol can has the advantage for delivery of reactive mixtures. For example, 2K reactive mixture can use low molecular weight monomer, oligomer, and functionalized low molecular polymer to make final cross-linked high molecular weight polymer. 2K aerosol can increase solid contents and deliver high performance polymer products, such as curable paints, foams, and adhesives. Canned air / dusters do not contain air, and are dangerous, even deadly, to inhale. Aerosol contents may be deliberately inhaled to achieve intoxication from the propellant (known as inhalant abuse or "huffing"). Calling them "canned air" or "cans of compressed air" could mislead the ignorant to think they are harmless. In fact, death has resulted from such misuse. Aerosol burn injuries can be caused by the spraying of aerosol directly onto the skin, in a practice sometimes called "frosting". Adiabatic expansion causes the aerosol contents to cool rapidly on exiting the can. The propellants in aerosol cans are typically combinations of ignitable gases and have been known to cause fires and explosions. However, non-flammable compressed gases such as nitrogen and nitrous oxide have been widely adopted into a number of aerosol systems (such as air fresheners and aerosolized whipped cream) as have non-flammable liquid propellants. In the United States, non-empty aerosol cans are considered hazardous waste but are still considered "recyclable when empty", in US curbside recycling programs. ^ Kvilesjø, Svend Ole (17 February 2003). "Sprayboksens far er norsk". Aftenposten (in Norwegian). Archived from the original on 30 June 2008. Retrieved 6 February 2009. ^ U.S. Patent 2,170,531 — Appratus for Mixing a Liquid With a Gas, granted August 22, 1939. ^ Carlisle, Rodney (2004). Scientific American Inventions and Discoveries, p.402. John Wiley & Songs, Inc., New Jersey. ISBN 0-471-24410-4. ^ Article “Aerosol Bomb”, by The Golden Home and High School Encyclopedia, Golden Press, New York, 1961. ^ Core, Jim, Rosalie Marion Bliss, and Alfredo Flores. (September 2005) "ARS Partners With Defense Department To Protect Troops From Insect Vectors". Agricultural Research MagazineVol. 53, No. 9 . ^ "Chloroflurocarbons CFCs History". Consumer Aerosol Products Council. Retrieved 2015-07-20. ^ a b Weiss, Edith Brown (2009). "The Vienna Convention for the Protection of the Ozone Layer and the Montreal Protocol on Substances That Deplete the Ozone Layer" (PDF). United Nations Audiovisual Library of International Law. United Nations. Retrieved 20 July 2015. ^ Nash, Eric R. (23 September 2013). "History of the Ozone Hole". NASA Ozone Hole Watch. NASA. Retrieved 2015-07-20. ^ "The Accelerated Phaseout of Class I Ozone-Depleting Substances". United States Environmental Protection Agency. 19 August 2010. Retrieved 2015-07-20. ^ "Solstice® Propellant Technical Information" (PDF). Honeywell. ^ "Aerosol Propellant / Pressurisation Filling Machine - R + R Aerosol Systems Ltd". R + R Midlands Ltd. Retrieved 2019-02-19. ^ a b "Dust Off Death". snopes.com. Retrieved 2015-05-24. ^ "Deodorant burns on the increase". ABC News. 10 July 2007. ^ a b "Paint & Aerosol Safety". uvm.edu. The University of Vermont. Retrieved 20 July 2015. ^ "Solstice Propellant for Aerosols". Honeywell Aerosols. Retrieved 11 March 2019. ^ "How to Recycle Aerosol Cans". Earth911. Wikimedia Commons has media related to Spray cans.